This article is about the wetland. For other uses, see Bog (disambiguation). Bogs have distinctive assemblages of animal, fungal and plant species, and are of high importance for biodiversity, particularly in landscapes that are otherwise settled and farmed. 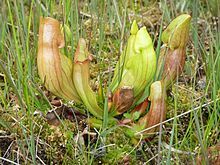 Carnivorous plants, such as this Sarracenia purpurea pitcher plant of the eastern seaboard of North America, are often found in bogs. Capturing insects provides nitrogen and phosphorus, which are usually scarce in such conditions. Bogs are widely distributed in cold, temperate climes, mostly in boreal ecosystems in the Northern Hemisphere. The world's largest wetland is the peat bogs of the Western Siberian Lowlands in Russia, which cover more than a million square kilometres. Large peat bogs also occur in North America, particularly the Hudson Bay Lowland and the Mackenzie River Basin. They are less common in the Southern Hemisphere, with the largest being the Magellanic moorland, comprising some 44,000 square kilometres (17,000 sq mi). Sphagnum bogs were widespread in northern Europe  but have often been cleared and drained for agriculture. An expanse of wet Sphagnum bog in Frontenac National Park, Quebec, Canada. Spruce trees can be seen on a forested ridge in the background. Many species of evergreen shrub are found in bogs, such as Labrador tea. Bogs are recognized as a significant/specific habitat type by a number of governmental and conservation agencies. They can provide habitat for mammals, such as caribou, moose, and beavers, as well as for species of nesting shorebirds, such as Siberian cranes and yellowlegs. The United Kingdom in its Biodiversity Action Plan establishes bog habitats as a priority for conservation. Russia has a large reserve system in the West Siberian Lowland. The highest protected status occurs in Zapovedniks ( IUCN category IV); Gydansky  and Yugansky are two prominent examples. Bogs even have distinctive insects; English bogs give a home to a yellow fly called the hairy canary fly ( Phaonia jaroschewskii), and bogs in North America are habitat for a butterfly called the bog copper ( Lycaena epixanthe). In Ireland, the viviparous lizard, the only known reptile in the country, dwells in bogland. Bog habitats may develop in various situations, depending on the climate and topography  (see also hydrosere succession). Aerial image of Carbajal Valley peat bogs, Tierra del Fuego Province, Argentina. These develop in gently sloping valleys or hollows. A layer of peat fills the deepest part of the valley, and a stream may run through the surface of the bog. Valley bogs may develop in relatively dry and warm climates, but because they rely on ground or surface water, they only occur on acidic substrates. 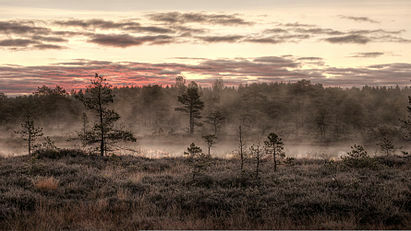 Viru Bog in Lahemaa National Park, Estonia, which is rich in raised bogs. These develop from a lake or flat marshy area, over either non-acidic or acidic substrates. Over centuries there is a progression from open lake, to a marsh, to a fen (or on acidic substrates, valley bog), to a carr, as silt or peat accumulates within the lake. 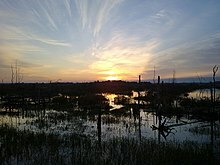 Eventually, peat builds up to a level where the land surface is too flat for ground or surface water to reach the center of the wetland. This part, therefore, becomes wholly rain-fed ( ombrotrophic), and the resulting acidic conditions allow the development of bog (even if the substrate is non-acidic). The bog continues to form peat, and over time a shallow dome of bog peat develops into a raised bog. The dome is typically a few meters high in the center and is often surrounded by strips of fen or other wetland vegetation at the edges or along streamsides where groundwater can percolate into the wetland. Sphagnum moss and sedges can produce floating bog mats along the shores of small lakes. This bog in Duck Lake, Oregon also supports a carnivorous plant, sundew. 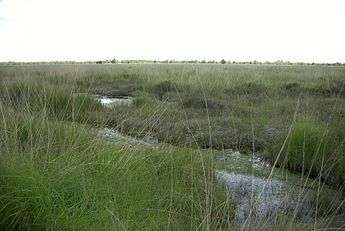 In cool climates with consistently high rainfall (on more than c. 235 days a year), the ground surface may remain waterlogged for much of the time, providing conditions for the development of bog vegetation. In these circumstances, bog develops as a layer "blanketing" much of the land, including hilltops and slopes. Although a blanket bog is more common on acidic substrates, under some conditions it may also develop on neutral or even alkaline ones, if abundant acidic rainwater predominates over the groundwater. 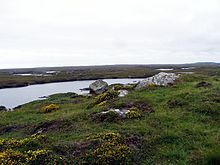 A blanket bog cannot occur in drier or warmer climates, because under those conditions hilltops and sloping ground dry out too often for peat to form – in intermediate climates a blanket bog may be limited to areas which are shaded from direct sunshine. In periglacial climates a patterned form of blanket bog may occur, known as a string bog. In Europe, these mostly very thin peat layers without significant surface structures are distributed over the hills and valleys of Ireland, Scotland, England and Norway. In North America, blanket bogs occur predominantly in Canada east of Hudson Bay. These bogs are often still under the influence of mineral soil water (groundwater). Blanket bogs do not occur north of the 65th latitude in the northern hemisphere. A cataract bog is a rare ecological community formed where a permanent stream flows over a granite outcropping. The sheeting of water keeps the edges of the rock wet without eroding the soil, but in this precarious location, no tree or large shrub can maintain a roothold. The result is a narrow, permanently wet habitat. Bogs may also be classified by the nutrient content of the peat. 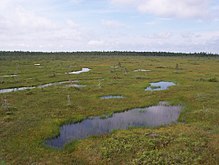 Sitniki peat bog in Russia recultivated after industrial use. The other major use of dried peat is as a soil amendment (sold as moss peat or sphagnum peat) to increase the soil's capacity to retain moisture and enrich the soil. It is also used as a mulch. Some distilleries, notably in the Islay whisky-producing region, use the smoke from peat fires to dry the barley used in making Scotch whisky. Blueberries, cranberries, cloudberries, huckleberries, and lingonberries are harvested from the wild in bogs. Bog oak, wood that has been partially preserved by bogs, has been used in the manufacture of furniture. Sphagnum bogs are also used for outdoor recreation, with activities including ecotourism and hunting. For example, many popular canoe routes in northern Canada include areas of peatland. Some other activities, such as all-terrain vehicle use, are especially damaging to bogs. The anaerobic environment and presence of tannic acids within bogs can result in the remarkable preservation of organic material. Finds of such material have been made in Denmark, Germany, Ireland, Russia, and the United Kingdom. Some bogs have preserved bog-wood such as ancient oak logs useful in dendrochronology, and they have yielded extremely well preserved bog bodies, with hair, organs, and skin intact, buried there thousands of years ago after apparent Germanic and Celtic human sacrifice. Excellent examples of such human specimens are Haraldskær Woman and Tollund Man in Denmark,  and Lindow man found at Lindow Common in England. At Céide Fields in County Mayo in Ireland, a 5,000-year-old neolithic farming landscape has been found preserved under a blanket bog, complete with field walls and hut sites. One ancient artifact found in various bogs is bog butter, large masses of fat, usually in wooden containers. These are thought to have been food stores, of both butter and tallow. 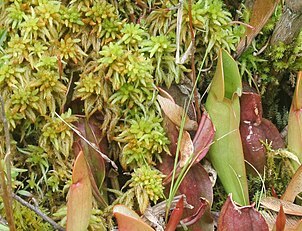 Sphagnum with northern pitcher plants at Brown's Lake Bog, Ohio. Bog-wood and boulders at the Stumpy Knowe near South Auchenmade, Ayrshire, Scotland. ^ a b c d e Keddy, P.A. (2010). Wetland Ecology: Principles and Conservation (2nd ed.). Cambridge University Press. ISBN 978-0521739672. ^ a b c d e "British Soil Is Battlefield Over Peat, for Bogs' Sake". The New York Times. 6 October 2012. Archived from the original on 7 October 2012. Retrieved 7 October 2012. ^ Gorham, E. (1957). "The development of peatlands". Quarterly Review of Biology. 32: 145–66. ^ a b Fraser, L.H. ; Keddy, P.A., eds. (2005). The World's Largest Wetlands: Ecology and Conservation. Cambridge, UK: Cambridge University Press. ISBN 9780521834049. ^ Adamovich, Alexander (2005). "Country Pasture/Forage Resource Profiles: Latvia". Food and Agriculture Organization of the United Nations. ^ Smith, David (27 May 2014). "Peat bog as big as England found in Congo". The Guardian. Retrieved 31 May 2014. ^ Keddy, P.A. (2007). Plants and Vegetation: Origins, Processes, Consequences. Cambridge, UK: Cambridge University Press. ISBN 0521864801. ^ Archibold, O.W. (1995). Ecology of World Vegetation. London: Chapman and Hall. ISBN 978-0-412-44290-2. ^ Bond, G. (1985). Salisbury, F.B. ; Ross, C.W. (eds.). Plant Physiology (Wadsworth biology series) (3rd ed.). Belmont, CA: Brooks/Cole. p. 254. ISBN 0534044824. See figure 13.3. ^ a b Solomeshch, A.I. (2005). "The West Siberian Lowland". In Fraser, L.H. ; Keddy, P.A. (eds.). The World’s Largest Wetlands: Ecology and Conservation. Cambridge, UK: Cambridge University Press. pp. 11–62. ISBN 9780521834049. ^ "Russian Zapovedniks and National Parks". Russian Nature. Archived from the original on 11 March 2018. Retrieved 8 March 2018. ^ Glaser, P.H. (1992). "Raised bogs in eastern North America: regional controls for species richness and floristic assemblages". Journal of Ecology. 80: 535–54. ^ Damman, A.W.H. (1986). "Hydrology, development, and biogeochemistry of ombrogenous bogs with special reference to nutrient relocation in a western Newfoundland bog". Canadian Journal of Botany. 64: 384–94. ^ van Breeman, N. (1995). "How Sphagnum bogs down [ sic] other plants". Trends in Ecology and Evolution. 10: 270–275. ^ Appleton, Andrea (6 March 2018). "How Do You Solve a Problem Like a Giant Floating Bog?". Atlas Obscura. Retrieved 8 March 2018. ^ a b c Walter, Heinrich; Breckle, Siegmar-W. (2012). Ecological Systems of the Geobiosphere: 3 Temperate and 3 Polar Zonobiomes of Northern Eurasia. Stuttgart: Springer. pp. 463–464. ISBN 978-3-642-70162-7. 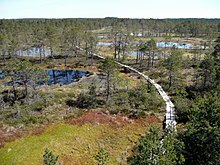 ^ "Great Kemeri Bog Boardwalk". Latvia Travel. Archived from the original on 21 December 2017. Retrieved 21 December 2017. ^ de Róiste, Daithí. "Bord na Móna announces biggest change of land use in modern Irish history". Bord na Móna. Bord na Móna. Archived from the original on 7 October 2015. Retrieved 6 October 2015. ^ Campbell, D.R. ; Rochefort, L. (2003). "Germination and seedling growth of bog plants in relation to the recolonization of milled peatlands". Plant Ecology. 169: 71–84. ^ Cobbaert, D.; Rochefort, L.; Price, J.S. (2004). "Experimental restoration of a fen plant community after peat mining". Applied Vegetation Science. 7: 209–20. ^ "Insight into threatened peat bogs". BBC News. 31 July 2004. Archived from the original on 24 October 2007. Retrieved 8 March 2018. ^ "Destruction of peat bogs". RSPB. Archived from the original on 30 September 2007. ^ Gorham, E. (1991). "Northern peatlands role in the carbon cycle and probable responses to climatic warming". Ecological Applications. 1: 182–95. ^ Glob, P.V. (2011). The Bog People: Iron Age Man Preserved. Faber and Faber. ISBN 0571270905. Look up bog in Wiktionary, the free dictionary. Wikimedia Commons has media related to Bog. "Bog" . Encyclopædia Britannica (11th ed.). 1911. "Bog" . The American Cyclopædia. 1879.